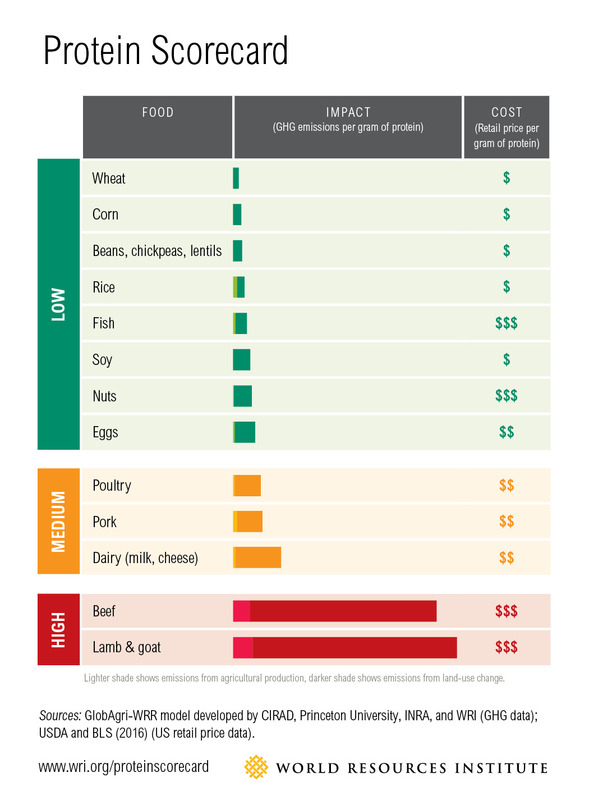 WRI’s new research confirms that, for those of us who eat a lot of meat and dairy, shifting to diets with a greater share of plant-based foods can alleviate pressure on scarce land and water resources, reduce GHG emissions, and help sustainably feed a population expected to approach 10 billion by 2050. But I’ve spent years enjoying milk in my breakfast cereal and meat in my sandwiches at lunch, and usually plan dinner around some sort of meat or fish. Going fully vegetarian or vegan seems daunting to me, although I respect others’ decisions to do so. As I started getting closer to this issue, though, it dawned on me that although my diet’s environmental footprint was probably pretty high, there was a palatable path forward to reducing it. Here in the United States, we consume a lot of meat and dairy. The average American man consumes almost 100 grams of protein a day, nearly twice as much as he needs. About two-thirds of that protein comes from meat and dairy. As a result, the U.S.-style diet’s environmental footprint—in terms of land required to grow the food and the greenhouse gases (GHG) emitted each year from producing it—is nearly twice as high as the world average. Meat and dairy production (shown in red, orange and yellow in the chart below) account for nearly 85 percent of the GHG emissions and 90 percent of the agricultural land use associated with the average American diet. About half of the emissions and land use are from beef alone (shown in red). Working with the French agricultural research institutions CIRAD and INRA, we’ve run the numbers to explore the impact of different diets. The average American could go fully vegetarian and cut his or her diet-related land use and GHG emissions by more than half—but that’s also a pretty big shift to make. Just shifting one-third of my beef consumption to other meats like chicken or pork could cut my diet’s environmental impacts by nearly 15 percent—not a bad start. If I wanted to cut my beef consumption all the way down to the world average—reducing it by about 70 percent—I’d cut my diet’s impacts by about a third. Going a bit bolder, I could think about cutting my meat, dairy, fish and egg consumption by half. Because I’m maintaining a healthy weight, I’d need to add some additional plant-based foods to my diet—beans and rice, hummus, tofu, nuts, bread, fruits and veggies and so on. My diet’s environmental impacts would then go down by nearly half. In fact, that starts to approach the environmental benefit of going fully vegetarian, as most vegetarians replace a good chunk of the meat in their diet with dairy, which is similar in impact to most meats. So how do these shifts actually play out across my day? Truth be told, I still enjoy that same old bowl of cereal and milk every morning. It’s the most “automatic” meal of my day, and it’s been my go-to since I was about five. Old habits die hard! For lunch, I usually buy something on the go, and typically go fully vegetarian or vegan. I get the burrito with beans and guacamole instead of pork, the wrap with falafel and hummus instead of chicken, the rice bowl with tofu and peanut sauce instead of beef. I resist the temptation to pile on the cheese or tzatziki or sour cream, and add some bread, fruit or nuts on the side if I think I’ll still feel hungry. I also try to limit my snacks throughout the day to plant-based ones. For dinner, I go vegetarian about half of the time. Beef is now a “luxury” that I eat a couple times a month—instead I usually opt for chicken, eggs or fish if there’s going to be an animal-based food on my plate. My pizza now has only veggies on it, and although I was generally a three-slice guy, I’ve found that two slices can fill me up—especially if I have some bread or salad on the side instead. And that’s it! Across my day, I’ve shifted heavily from beef toward other meats, and probably cut my meat and dairy consumption by about half. In doing so, I’ve probably reduced my footprint by about half. I still get to enjoy my meat and dairy, but now that hectare of land that was used to grow the food that feeds me each year can grow food to feed two people. Let’s think big. Imagine all of the world’s meat and dairy lovers tweaked their diets in similar ways. Our research shows that if the 2 billion people who consume a lot of meat and dairy today did this, it would free up about 640 million hectares (1.6 billion acres) of land currently dedicated to growing animal feed. That’s an area of land twice the size of India. In a world that will be home to nearly 10 billion people by 2050—and is projected to face a 70 percent food gap between food produced today and that needed by mid-century—freeing up this land can go a long way to sustainably and equitably feeding everyone. And all that just from a bunch of small diet tweaks.